THREE WISE MEN CAME FROM THE EAST for the infant Jesus in The New Testament. Three brave companions accompany the Buddha in the Chinese classic A Journey to the West. Could they have been the same three? Guided by a star, three strange companions arrive in the barbarous land of Judea to seek a newborn child–a possible messiah to some, and the reincarnation of the Budda to others. When the child’s life is threatened, his family and new guardians escape to Egypt, returning years later, to a Jewish land on the cusp of annihilation by the Roman Empire. Published as a 200 copy limited hardcover edition by Immersion Press (SOLD OUT). Cover art by Melissa Gay. repurposes the mythic with a deft touch that retains some degree of familiarity yet introduces enough difference to produce a stark sense of contrast . . . has [Tidhar’s] characteristic lightness of tone juxtaposed with gravitas and respect for his subject matter. – Vector, the critical journal of the British Science Fiction Association. inspired and fantastical… a kind of fable or fairytale or mythic intonation that blends intimacy with the remoteness of legend. Witty and entertaining. – Asimov’s Science Fiction Magazine. 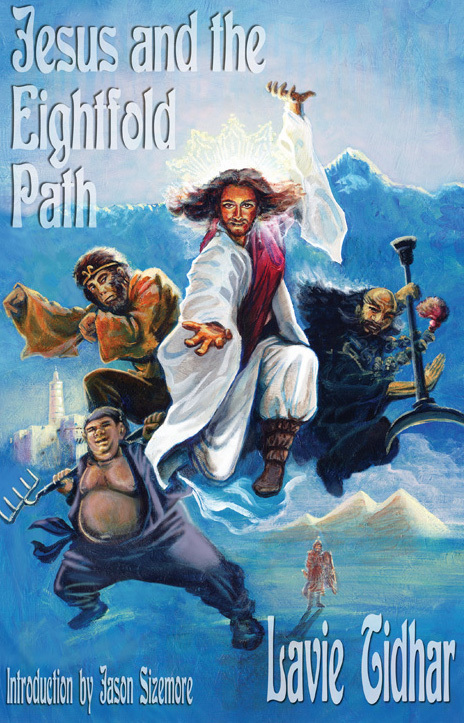 Jesus & The Eightfold Path was a free serial novella published in early 2010, initially at the Apex Books blog. It answers one simple question – what if the three wise men from the New Testament were the same three companions of the Buddha in the Chinese classic A Journey to the West? A limited hardcover edition of Jesus The Eightfold Path was published in 2011 by Immersion Press. It is now available in both e-book and audiobook editions. The links all seem to lead to 404 errors for me. Is this available anywhere as an ebook? I don’t mind paying for it, I just prefer digital. I discovered your writing via Smashwords, and love your storytelling ability. Maybe you could make it one of the peerbacker award options? I kicked in on that, just ‘cuz, hey, it’s Lavie! I love Peerbacker & Kickstarter. Hey, I just looked into it, looks like the pages were lost in a malware attack on the server recently! I’ll update the page – I’m going to try and do an e-book edition of the book. Couldn’t agree more about the importance of an ebook – please do it!